The Colonist Update brings a lot of psychology related features to Founders' Fortune. You can try the game for free, find us on Twitter and visit the Forum. In game design, often times the primary goal is eliciting motivation. Sure, that's not the only goal, and maybe not even the most imporant one - but it is insdispensable nevertheless. If a player doesn't want to play the game in the first place, why should they care about graphics or performance? 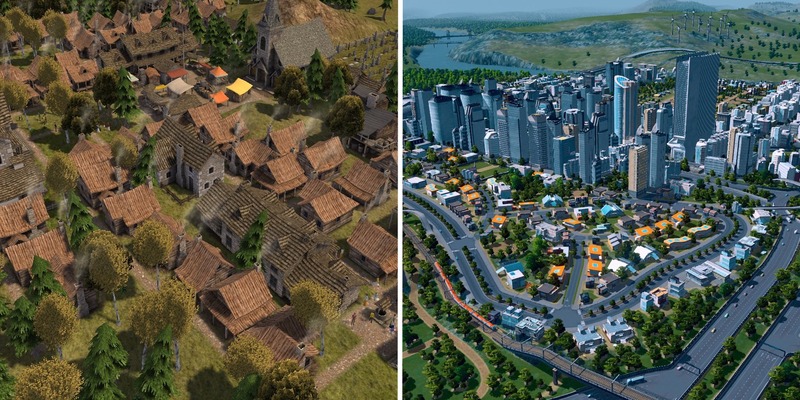 In city building games, you know if a town is great by seeing how large it is - but how do you know if the inhabitants are happy? Typically, games elicit motivation with a highscore or a progression system: How many zombies did you kill, how many technologies did you unlock and how many inhabitants does your empire have? To the player, it is made perfectly clear when they succeed: They notice when they kill a zombie, they notice when they can unlock new skills and they also notice when their city has a lot of houses. How do they notice if their citizens are happy? 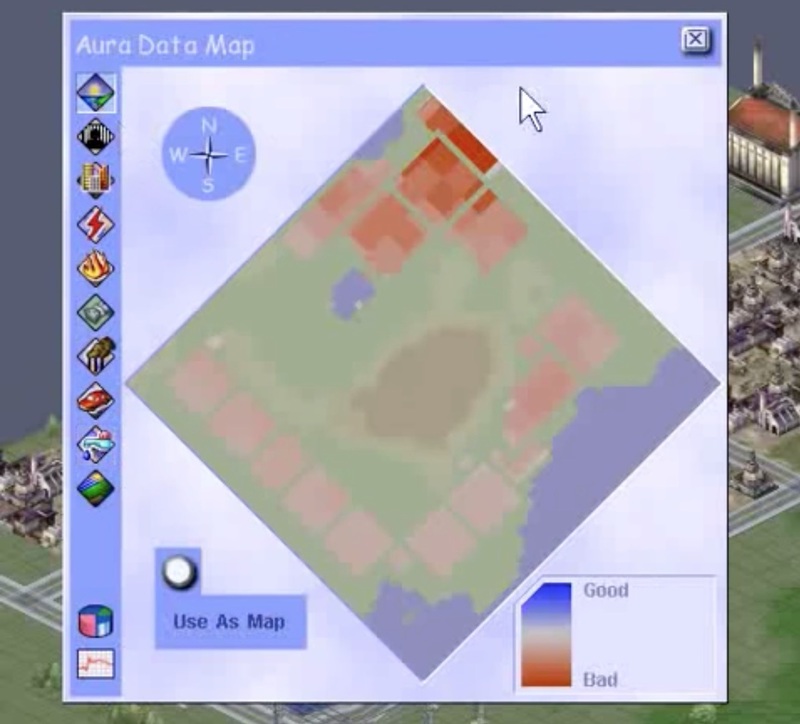 An overview like this is simple and clear for a city builder, but Founders' Fortune is way more zoomed in, way closer to the action. So what can we do? At first, we thought it may be good enough to just show the player how happy or sad their colonists are and count on their empathetic response. We started rendering a real time colonist picture as a part of the UI. We put a lot of work into it, adding animations for happiness, sadness, a netural face and an angry expression. 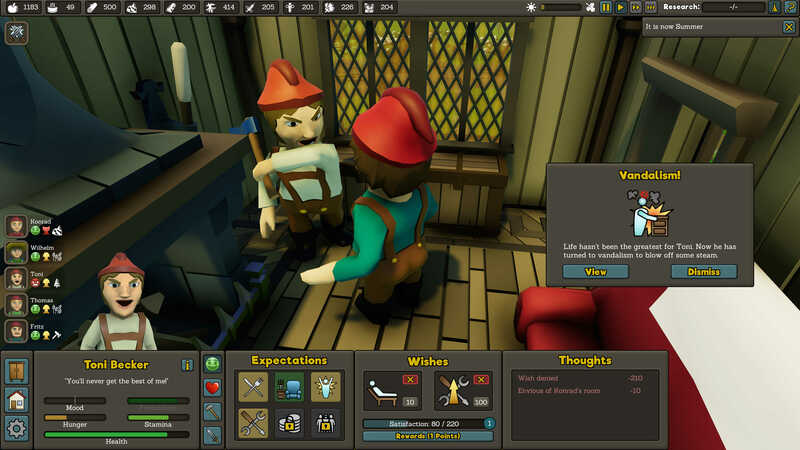 When the colonist is selected, the player can see the face and feel good or bad about the living situation he had accomplished in the colony. An early attempt at showing the player if their colonists are happy. This works to some degree and it certainly looks cool. However, players quickly begin just not paying attention to the face in the user interface and focus their attention on production chains and buildings - there was no in-game relevance to the mood of the colonist. Any player with some knowledge of colony simulators knows about the temper trantrums in Dwarf Fortress and the breaks in Rimworld. Both are basically negative game events that are triggered based on prolonged negative mood of the inhabitants in the settlement. These events can range from minor inconveniences to devastating fights that start a downward spiral into chaos.Apparently this mechanic works fine in these games, so why not try the same thing with Founders' Fortune? Toni has a difficult relationship with vandalism. Toni got angry because his wishes were not fulfilled. He started to mess up Leonardo's dresser - Leonardo didn't like that at all. After a couple of minutes, there was a wonderful commotion, some injuries and angry faces all around. We noticed that players actually started to care about colonist mood now - about not letting it dip down too far. But is there any reason why they should make their colonists more happy if they're just ok? And besides, Founders' Fortune isn't suppossed to be a game where you're constantly fighting mayhem and putting out fires - so we make this mechanic a central part of the game. Is there another way to make mood relevant? How about we take a step back and reframe the problem? There is more to happiness than just mood alone. For example, if a colonist is happy with his life in the colony, that is not going to change when he has a bad day. Some components of happiness are long term, and those provide the ideal base to make a game mechanic out of it. The first long term systems we added is 'life satisfaction'. 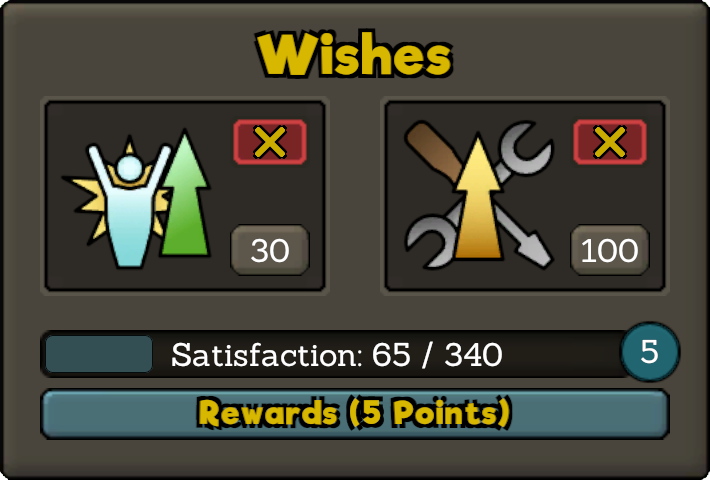 Colonists now have wishes and desires, similar to the wish system in the Sims. These wishes made visible to the player, who can then decide if they are going to fulfill or decline them. Both options influence mood in the short term, but fulfilled wishes also increase the colonist's life satisfaction. Life satisfaction has a great long term impact, as satisfied colonists are able to gain new permanent traits or forget some negative ones. You need to fulfill at least some wishes if you want your colonists to be satisfied with their life in the settlement. 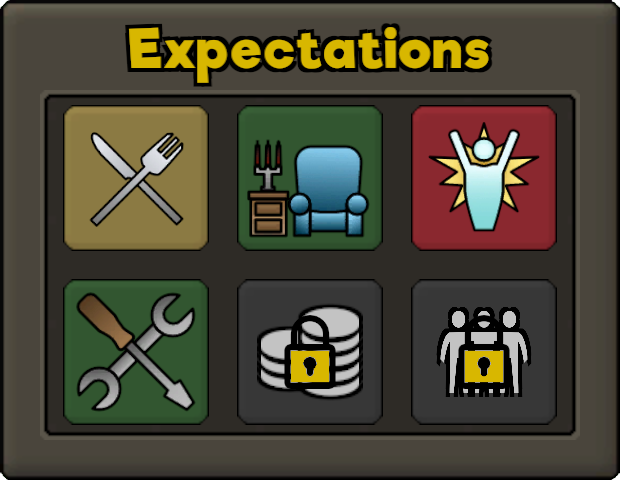 To double up even more on this concept of coupling long term goals with colonist happiness, we implemented an expectation system: When the settlers arrive at their new home, they don't expect much. A sleeping bag is enough to make them content with their situation. As the colony grows, so do the expectations, and soon colonists expect good food, their own bedrooms, promotions and even a certain degree of life satisfaction - which re-uses the new wish-system. Expectations tell you how the colonists feel about their living situation - the larger the town, the more they expect! Most of these expectations are integrated with pre-existing systems: Our farming system provides a lot of different types of food already, so it makes sense to re-use these for the new expectation mechanic. 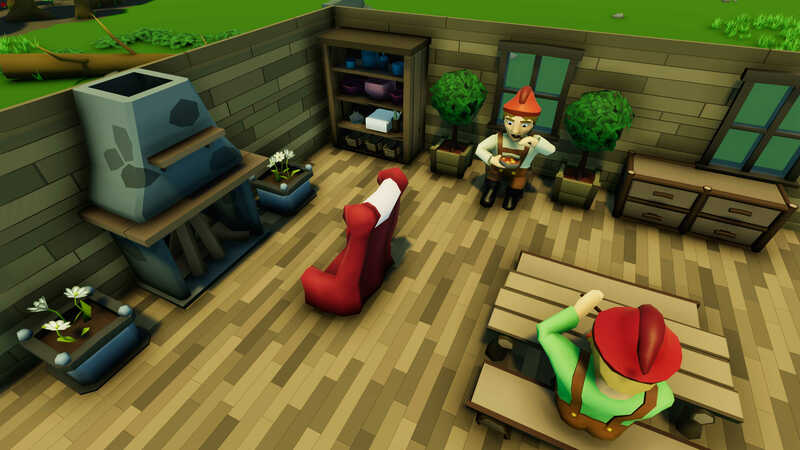 Bedrooms, houses were implemented already, just as the skill and promotion system for colonist professions. At some point, people are going to expect their own bedrooms and even their own houses! No more wooden shacks with shared accomodation! So why would a player care about these expectations now? Because they are necessary for growing your colony. As migrants consider your settlement, they take into account if the expectations of the inhabitants are met. That way, the player can only progress in the game if they care for their colonists - which was our design goal in the first place. So why go through all this trouble? Couldn't we just design it like a tower defense game and have all the motivation mechanics we need? Or a survival game where it's enough motivation to survive another day? In Founders' Fortune, you spend a lot of time with just a couple of colonists and they're not always in mortal danger. So when a colonist is injured or even dies, that's a big deal. 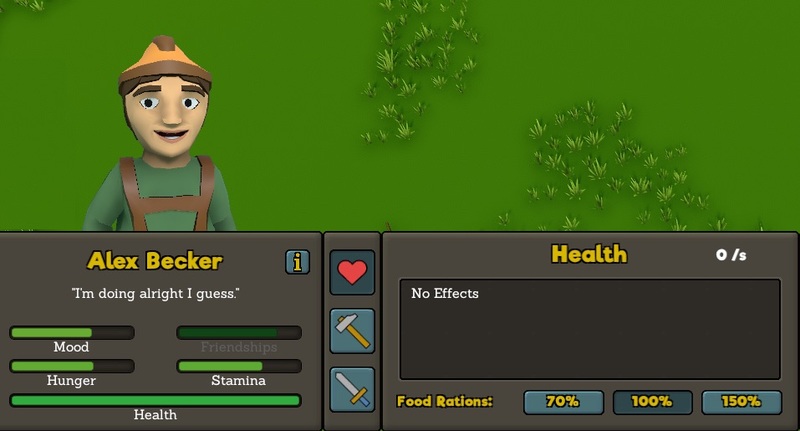 It's an even bigger deal if the player spent a lot of time getting to know the colonist, fulfilling his wishes and slowly building his life satisfaction. At that point, the colonist doesn't even have to actually die to make an emotional impact. You'll be gritting your teeth already when he gets caught in an ambush or catches a life-threatening diesease. This way, we hope to make Founders' Fortune a calm and creative experience mixed with occasional moments of danger and excitement. Two friends enjoying their meal in a tastefully decorated living room. 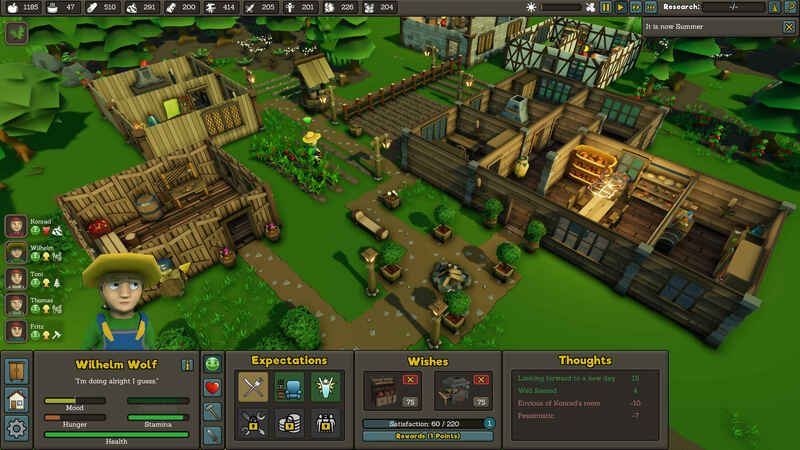 Our 3D fantasy colony simulator gets a lot of new content for Alpha 4. We're looking for testers and launched a new forum. © 2010 - 2019 DBolical Pty Ltd. All Rights Reserved. Sequel free since 1998.